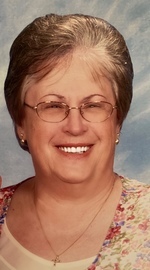 Elizabeth Rae Taylor, “Liz”, 76 of California, MD passed away on April 9, 2019 in Leonardtown, MD. Born on September 20, 1942 in Washington, DC she was the daughter of the late Nora E. Kemp Barber and Ellis R. Barber. Liz was the loving wife of Milton Francis Taylor, Jr., whom she married on April 5, 1997 in Culpeper, VA. She is survived by her daughter, Nora V. Gundlach (Dan) of Haymarket, VA. and her siblings; James Barber, Ellis H. Barber and Joyce Ann Reggi, also survived by her step-children, Michael (Betty) Taylor, Christopher (Suzy) Taylor, Katherine Taylor and Barbara (Gary) Wright. Liz is preceded in death by her sister, Dorothy I. Barber Isenberg-Phipps. Liz was employed as an Accountant for the Department of Defense at Naval Air Station Patuxent River, MD, retiring in 2014. The family will receive friends on Monday, April 15, 2019 from 9:00 AM – 10:00 AM in the Mattingley-Gardiner Funeral Home Leonardtown, MD where a Funeral Service will be held at 10:00 AM in the Funeral Home Chapel with Father Jerry Gamrot officiating. Interment will follow in Maryland National Memorial Park Cemetery Laurel, MD. Pallbearers will be the Virginia State Police. Contribution may be made to American Association for Catholic Charities 320 Cathedral Street Baltimore, MD 21201, National Foundation for Cancer Research 5515 Security Lane #1105 Rockville, MD 20852 and/or St. Jude Children’s Research Hospital 262 Danny Thomas Place Memphis, TN 38105. To send flowers to the family of Elizabeth Rae "Liz" Taylor, please visit our Heartfelt Sympathies Store.